We’ve been living in Long Island City for almost three years (almost five years by this 2nd publishing) now and we love it! The restaurant scene has really grown, although we could still use more. Naturally, whenever friends visit the area, they ask me for restaurant recommendations, as well as neighbors so I’ve been working on this blog post about Long Island City restaurants for a while now. There’s enough here to cover various tastes and still several more. Please bookmark this page. I’ll keep updating as I try all the restaurants in Long Island City! Here’s The Long Island City Restaurant Guide in alphabetical order. Aanchal 45-12 23rd Street, Long Island City, NY 11101is a pretty solid neighborhood Indian restaurant. The lunch buffet is decent and the delivery lunch deal is pretty good too. The inside is a lot bigger than you’d think from the outside and some tables are suitable for pretty large groups. Food is a tad spicier than the average New York Indian restaurant but far less spicy than you’d find in an Indian home. We don’t go or order often though since they don’t seem to understand what it means when you say someone (Lon) can’t have dairy. 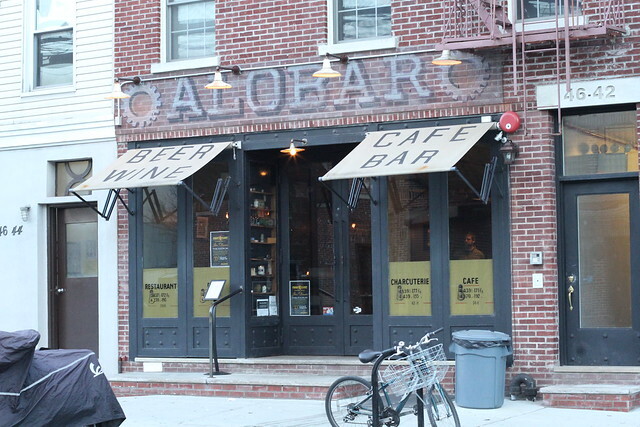 I love the staff at Alobar 46-42 Vernon Boulevard, Long Island City, NY 11101! They’ve always made me feel so welcome. They want kids and families along with everyone else in our hood. Plus the food is tasty too. Not quite yet a destination restaurant but definitely a must for any LIC-er. The only reason I don’t go more often is that the food is heavy American and I just can’t eat such heavy food so often. Anable Basin is the perfect place to grab a beer and chill outdoors by the water. There’s music playing, kids and dogs all over the place, and even an empty indoor room that the kids end up playing in. The food is simple as expected but surprisingly good. Get the salad! Head over early because you’ll have to find a table yourself. We’ve only ordered-in from BANY 10-57 Jackson Avenue, Long Island City, NY 11101 and they are consistently fast at delivery. It’s mostly what you’d expect from these kind of fusion-y Asian places. Nothing is amazing and nothing is that bad. All at reasonable prices. It’s as if these kind of places really intended on delivery business only. Order sushi sandwich and duck noodle soup. Barista Panini House , which was called Flour & Herbs for a short time when they first opened, uses fresh ingredients for a short simple menu of pretty standard salads and sandwiches. There’s a little bit of seating…and I will probably forget this place exists. While everyone we know seems to order pizza from Bella Via 47-46 Vernon Boulevard, Long Island City, NY 11101 regularly, we’re decidedly not going to anymore after two tries. I just don’t think this kind of thin crust coal oven pizza travels well. It also doesn’t reheat well. New York style pizza is what you want for delivery and stick to eating this kind of pizza straight out of the coal oven at the restaurant!! I did enjoy a few bites of Rigatoni Bolognese a friend had shared with me but it’s unlikely for us to order non-pizza dishes too because I tried getting a salmon dish for Lon, specifying “NO dairy” about 6 times and detailing what that includes (butter, milk, cream, cheese, etc.) and yet the vegetables on that plate came soaked in butter. Ultimately, Bella Via’s popularity was built during a time when Long Island City had few restaurants. It became a staple for the residents as they ordered take-out from a rotating list of four or five places. As the area booms and new (some really great) restaurants open up, Bella Via probably won’t be able to hold onto it’s undeserving pedestal. Brooks 1890 24-28 Jackson Avenue, Long Island City, NY 11101 is a bar/restaurant with a menu split between American and Italian. After one meal there, we will never go again. The service was terrible. The food was horrible. It was one of those places you’d expect to see on “Restaurant: Impossible”. Cafe Henri 10-10 50th Avenue, Long Island City, NY 11101 has some excellent crepes and eggs at reasonable prices. I’ve never tried dinner here. Weekend brunch is packed! Inside the LIC Arts Center you’ll find Caffiena Espresso Bar 44-02 23rd Street, Long Island City, NY 11101, a small place to get espresso-based drinks, soups, salads, and sandwiches. Again, I’m not going to judge coffee/espresso right now since I’m on decaf (breast-feeding) but the fresh sandwiches are half-price already low-prices after 4pm. They also have some baked goods from Balthazar. The only downside is that strollers and wheelchairs have to come in from the side of the building (a pretty long way) because the front has stairs only. 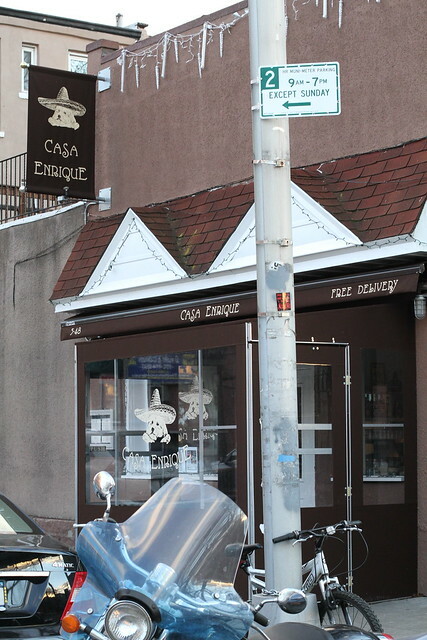 Casa Enrique 5-48 49th Ave, Long Island City, NY 11101 is not just “good for the neighborhood”. It’s a Pueblan Mexican restaurant actually worth traveling for, for brunch or dinner! (It’s only one stop from Manhattan on the 7-train.) Read the full review on this place! Chimney Cake [CLOSED]is a unique Hungarian-Transylvanian Pastry only sold here in all of NYC, as far as I know. It’s made fresh while you wait so it’s pretty awesome as fresh pastry is! However, if you wait too long to eat it, it’s not as awesome anymore. It comes in several flavors and it’s definitely worth a try at least once. Court Square Diner 45-30 23rd Street, Long Island City, NY 11101 is important to know in LIC because it’s open and delivering 24-hours. They didn’t even close during Hurricane Sandy! It’s an average NYC diner, at best, which isn’t saying much but hey when you need food at weird hours, go here. Every area needs those big over-sized delis with the sandwich station, salad station, pasta station, and a few random Asian menu items. Cranberry holds down the fort for LIC. Every neighborhood needs a casual, comfortable, and reliable place like Cranky’s Cafe 48-19 Vernon Boulevard, Long Island City, NY 11101. [CLOSED] They serve some Cajun/Creole items and the rest seems like standard American fare. The prices are reasonable and the service is welcoming. Definitely try the Homemade S.O.S. Dinner was kind of a let-down though. I’ve only been to Crescent Grill 38-40 Crescent Street, Long Island City, NY 11101 once but it is probably going to become one of our regular spots this year. We have a habit of ordering salads and vegetable sides when we go out because so many restaurants don’t put much vegetable on the main courses. We love that we don’t have to do that here. Every generously sized dish was absolutely delicious and covered in very fresh vegetables, really tasting farm-to-table. I’m still dreaming about the English Pea Risotto and Magret Duck. The service was also fantastic with nice decor. You could definitely bring a date here! Thanks to our friends Tim and Jessica Lo for telling us about Crescent Grill. There’s no way we would have found it otherwise. It’s in the middle of nowhere in the industrial part of LIC. To make up for that, they’ll send a car to pick you up and take you home from dinner. Cyclo 5-51 47th Avenue, Long Island City, NY 11101 is a welcome addition since we needed a Vietnamese spot and I can’t survive winter without several gallons of pho. It’s been hit (very good spring rolls bun-salad and chicken curry) or miss (awful papaya salad with shrimp) though and dining in has been better than delivery. It’s one of the cheaper options in the area. ENC Deli 5 Court Square, Long Island City, NY 11101 is a corner deli and the closest one to me so I’m grateful for it’s existence. Do I eat there? Not really, but I’m not into corner deli food. It seems average though. They could have been interesting since they have some Korean food on the menu but the few times I tried, it has been inconsistent, varying between terrible and just ok.
On one side, Five Star Diner 13-05 43rd Avenue, Long Island City, NY 11101 is a banquet space. The other side is a casual restaurant. The menu is a list of items with no descriptions. You’ll figure out quickly that this is not your average Greek Diner. It’s an Indian place. We’ve eater here once and ordered delivery once. We enjoyed most dishes and our waitress was so sweet, bringing extra things for the kids. Samosa with Cholley (Samosa smothered with chickpeas) is a must! Skip the Tikka Masala. The white meat chicken pieces are a little dry. 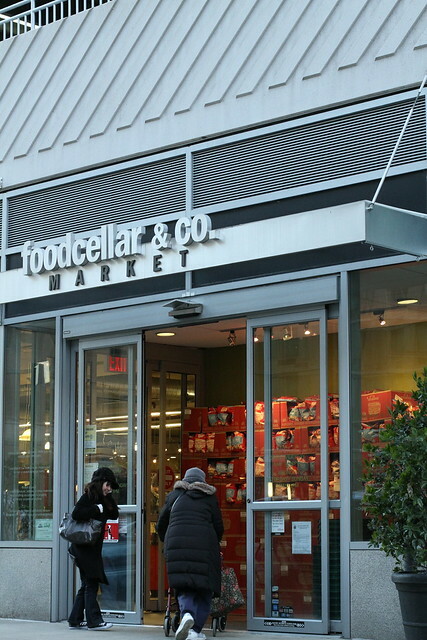 Food Cellar & Co. is a gourmet food market that looks kinda like a Whole Foods knock-off. As a supermarket they are way over-priced and I try not to ever shop there. However, the pizza oven is rockin’ and they make some good pizzas and sandwiches in there. The prepared food buffet sold by weight is decent too. There’s a modest self-service seating area. Gaw Gai Thai Express is possibly one of the worst Thai food places I’ve tried. Full review here. Yay! 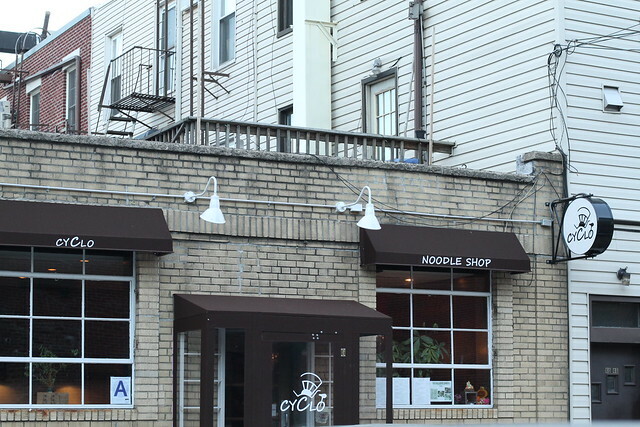 Hibino 10-70 Jackson Avenue, Long Island City, NY 11101, a popular Brooklyn restaurant has opened a location in LIC! They have good house-made tofu, Japanese tapas, sushi, and a few cooked entrees. I wouldn’t call anything amazing but we were fully satisfied. It’s a clean open space with good service and decent prices. We’ve only been to Il Falco 21-50 44th Drive, Long Island City, NY 11101 twice so far but I already have high hopes that this place will become one of our favorites. The work of two Il Mulino alumns lived up to my expectations with a delicious Italian meal and a pretty long menu of so much more I need to try. The white tablecloths, waiters in suits, and excellent service places Il Falco at the higher end for Long Island City but menu prices are affordable. Watch out for the very strong sales of the “specials” because these dishes are priced quite a bit higher than the regular menu. 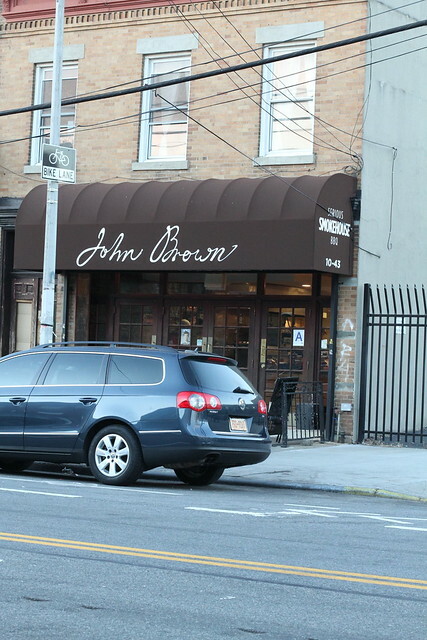 John Brown Smokehouse 10-43 44th Drive, Long Island City, NY 11101 just moved closer to us. Yes! This is our favorite BBQ joint in all of NYC! …and their new digs has an outdoor space. Read the full review here. From the outside, Jora 4746 11th Street, Long Island City, NY 11101 does not look exciting so we were pleasantly surprised by the well-lit and appealing interior. Then the waiter was really charming. I took tiny sips of everyone elses’ awesome cocktails and made mental note to come back when I can have them. At least I got the Chicha Morada, a traditional Peruvian drink made from corn, which sounds really weird but tasted like a nice juice. Standards like paella and skirt steak were expertly prepared and plated. Unique Peruvian dishes like the pumpkin stew with shrimp and octopus covered in a black olive sauce are wonderful and different. All of it comes at very affordable prices! We can’t wait to try more dishes here AND they even have a small parking lot! Lhawan2 [CLOSED] is reliable and cheap Filipino food, perfect for casual occasions and ordering in. The restaurant is much less ghetto than you’d expect. For a very safe bet, order the barbeque pork. Right on the water in the new Hunter’s Point South Park, which is gorgeous, sits LIC Landing by Coffeed 52 Center Boulevard, Long Island City, NY 11101. They sell coffee (obviously) but no decaf, beer, some frozen lemonade-ish stuff, and some pastries, sandwiches, burgers, and hot dogs. I haven’t tried any food yet (doesn’t seem that interesting) but they kind of win for location. You can even get there by East River Ferry which docks right by it. The prices are fine so just buy something so you can sit and enjoy the view. LIC Market 21-52 44th Drive, Long Island City, NY 11101 is a great neighborhood spot, small, cute, and homey. For those that miss the days of living in Manhattan, here you can pay Manhattan prices for Manhattan portions (with a few exceptions), with quality up to par. The menu is short and simple, seasonal, where rustic meets chic. The Halibut Sandwich was the best thing I ever ate there and would make this a destination if it were permanently on the menu but alas, that was a special. I can only speak for breakfast and lunch since I haven’t had dinner here yet. Be warned, this place gets packed and there could be a long wait. I feel like classic NY style pizza can be made in giant pies and reheated by the slice when ordered but that thin crust fancier style pizza needs to be made to order and eaten right away. At L’inizio, they use fresh local ingredients and resemble that fancier style of pizza but they make large pies and you can buy it by the piece (also rather small pieces for the price), which they will reheat for you. For me, it doesn’t really work but it’s a nice space with an outdoor garden. I believe you can order a whole pizza and have them make you one so it could work if you’re going with a group. I love the true neighborhood vibe of Malu 12-09 Jackson Avenue, Long Island City, NY 11101, [CLOSED] an ice cream shop opened by a husband and wife that live in the area. They have an ever-changing menu of ice cream flavors, some inspired or developed by other Long Island City businesses. I remember a very good strawberry ice cream and a nice huge affogato. With only one very mediocre brunch at Masso 4725 Vernon Boulevard, Long Island City, NY 11101, I can’t really form an opinion yet since it seems to be an Italian restaurant and we didn’t have any of what they specialize in. Manducatis Rustica 46-35 Vernon Boulevard, Long Island City, NY 11101 seems pretty popular among LIC-ers, especially those with kids. It’s casual Italian with enough space for bigger groups. The one time I went, the food was so mediocre. It’s one of those things where it kind of depends how often you need to eat out. If you live in LIC and eat out a lot, you’re going to need to rotate through the not-quite-enough restaurants in the area and this is barely pass-able. For us, we don’t eat out that much so we only return to the ones that are really good and this one doesn’t make the cut. We picked up pizza and fried calamari to-go from Manetta’s 10-76 Jacksome Avenue, Long Island City, NY 11101 once and the food showed some strong potential. We finally went back for a sit-down meal and discovered that it’s a perfect place for families where the waiters like kids and there’s a good list of solid pizzas and pastas to chose from. The good quality at good prices make it a neighborhood spot but not a destination. Every neighborhood has one or two (or ten in parts of Manhattan) Chinese take-outs. On my side of LIC, it’s Mr. Wonton 2604 Jackson Avenue, Long Island City, NY 11101 with the standard menu and the food is exactly what you’d expect of Chinese take-out. They actually have some seats in this place but who actually eats inside these places? Since my friend Julie was sweet enough to make a reservation (during a short time, they were taking same-day reservations at 3pm, now it’s first come-first serve), I’ve been to Mu Ramen! The ramen is rich and fantastic, as well as the appetizers which are more upscale than your average noodle shop. I like the simple space and the long communal table. It is noticeably pricey though which dissuades me a little but not as much as having to wait on line (especially outside in the winter when I want ramen). I had really high hopes when Murasaki opened because Caya always wants sushi but this is really just one of those hole in the wall cheap sushi joints in disguise. You can’t just use stone tiles on the walls, do some decent plating, and call it real sushi. Sorry. They are really nice and welcoming there, and the prices are cheap, so if you’re not picky, go ahead. I was excited to see Pink Canary 13-11 Jackson Avenue, Long Island City, NY 11101 open. It looks like a super cute and girly cupcake shop but alas, the cupcakes are covered in food coloring (I’m allergic) so I won’t be trying any. When Breadbox (see above) went downhill, I was so excited to see that Pumpernickel 23-10 44th Drive, Long Island City, NY 11101, a bagel store, was opening very close to my apartment. Alas, the bagels are dense without chewiness. If this business survives, it will be purely because it is right under the Citicorp building. Sage General Store 24-20 Jackson Avenue, Long Island City, NY 11101 was featured on Diners, Drive-Ins, and Dives and like the other four places we’ve been to from triple-D, this one also kind of stinks. The southern-style food is served from a steam table on their counter and tastes like such. They recently renovated and got rid of the steam tables so I’m debating trying the food again but in no rush. However, the coffee (hot and iced) is good and they offer organic milk/cream. The raspberry iced tea and lemonade are also nice so think of this as a place for beverages only. Expect to wait a while for service. They changed their business concept yet again and are currently a lunch and dinner restaurant, attempting to go a little more upscale. I’ve lost interest in trying this confused place. Sweetleaf 10-93 Jackson Avenue, Long Island City, NY 11101 is a true coffee shop and though they’ve expanded, I still don’t recommend trying to bring a stroller in there. Pathways are very narrow. For a while, I was making it a regular stop for Iced Americanos but had to nip my habit. The baked goods are pretty good too. Now, they have multiple locations. 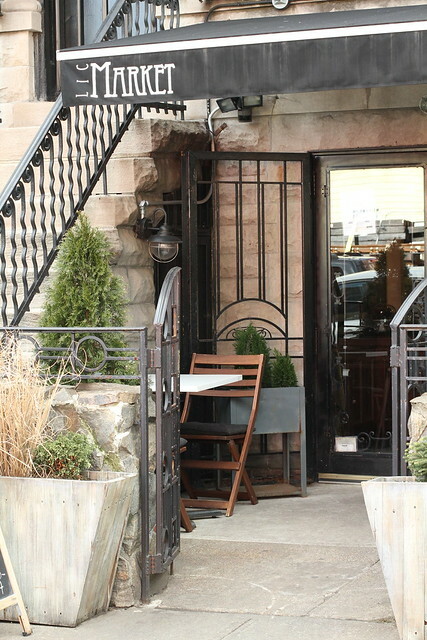 I really wanted to like Testaccio 47-30 Vernon Boulevard, Long Island City, NY 11101 because it’s a nice looking restaurant serving Roman Italian cuisine. It looks like a place you could take guests and the menu has some enticing dishes. Alas, the food is hit or miss, and all of it is drastically over-priced. The burgers at The Burger Garage 25-36 Jackson Avenue, Long Island City, NY 11101 are fine, not bad, but not note-worthy either. I prefer to make my own burgers. However, I do really like their crispy sweet potato fries and thick shakes. That used to mean I’d stop by for snacks but not meals but recently, my friend Rita told me about their veggie burgers. I’m not a veggie burger person but this chickpea patty with a Bangladeshi spin (just a bit spicy) really rocks. Ask for extra pickles on it! The Creek & The Cave 10-93 Jackson Avenue, Long Island City, NY 11101 is a comedy club and Mexican cafe. I’ve heard good things about the shows here. We’ve only ordered delivery from them and that we’re unlikely not do again. Perhaps one of the best values for a healthy meal for a family of four in LIC are the family combos at The Inkan 4502 23rd Street, Long Island City, NY 11101 that range between $27 and $35. You’ll get a whole Peruvian style rotisserie chicken with a salad (with a lot of avocado) and sides. The decor is not exciting here and the place is pretty small but the chicken is better fresh off the spit, rather than delivered. The Mill 44-61 11th Street, Long Island City, NY 11101, a coffee shop opened by and in the same building as Neue Atelier (a design studio) is a welcome addition to our neighborhood because it’s a bit closer for those that live near the Citi Corp building than Sweatleaf. It has the full-line of expected espresso based drinks and a nice selection of baked goods, including some vegan options. I’m going to refrain from judging the coffee/espresso right now because I’m still on decaf (breast-feeding). Tournesol is an awful little French place. It’s dirty and needs to be closed by the health department! Full review here. We had a strange first experience with Woodbines 47-10 Vernon Boulevard, New York, NY 11101. It was a cold snowy day last winter when Remi was maybe 2 months old and we decided to go in for an early brunch. After ordering and waiting for a while, we were told they just opened so it takes some time for the heat to kick in. The food was taking a while as we huddled with our kids with jackets on and some time later they told us the heat was broken. We asked them to just pack the food so we could take it to go but the food was taking a really long time. Eventually they offered to deliver it. We accepted the offer and included a tip for the delivery and left. We headed home and when the food came, we enjoyed it but the overall experience was already tainted. So I guess that’s not much of a review of this place except that the customer service wasn’t very thoughtful. I’m not going to bother reviewing the chain restaurants that are in the area but I will list them so you know they are here in LIC: Chickpea, Dominos, Dunkin Donuts (3), Kung Fu Tea, Petey’s Burger, Spice, Subway, Tozt (several of them in LIC), Quiznos (closed). Here’s a few places that we hope to try in the near future: Alewife, Beans Grapes and Leaves, Blissville Kitchen/Dutch Kills, Corner Bistro, Maiella, Queens & Pauper, Rockaway Brewing Company, Swallow My Words, and The Beast Next Door, The Shannon Pot. Also, there’s a few places I’m not so interested in so let’s acknowledge that they exist in LIC but they’ll probably never get reviewed: American Hero, Shi, Skinny’s Cantina. posted by jessica	at 10:53 AM	Filed under Restaurants. You can follow any responses to this entry through the RSS 2.0 feed. Both comments and pings are currently closed. Great post! I love how you don’t hold back. I generally agree with everything you’ve written here. I’d like to add Mario’s Deli. You would never notice it, but it’s a Real deli with great bread. It’s a piece of NYC that is rare now. Try the flat bagels at bricktown. The shows at Creek are mostly free, so that’s really nice. and let’s go to Manducatti’s regular! Petey Burger is decent though a bit expensive. Corner Bistro has some atmosphere, but I don’t think the burger is anything special… at all. and not sure what the name is, but there is this small cafe run by a Japanese guy that I want to try – it is in the back page of this season’s Edible Queens. Jeff, thanks for such a thoughtful comment! I’m excited about some of your suggestions! I’m putting Mario high up on my list now. I’ve walked by it so many times! Are you referring to the M Wells kiosk in PS 1 or the M Wells that closed? Funny, I just read about Resobox yesterday. I’d love to go with you and Veronica! or V also mentioned wanting to try Aanchal too which is high up on my list too!! 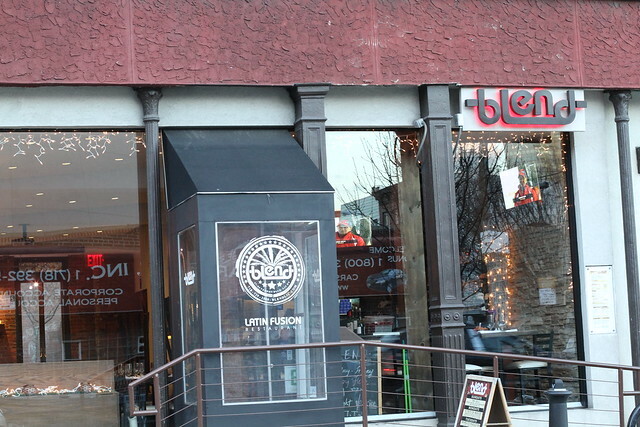 I have been to Blend a few times a few years ago – liked the food. Service was terrible ! They were nice…just couldn’t get it together ! I used to live in LIC, but moved away in 2003. At that time the restaurant list was far shorter than it is now, consisting of Court Square Diner, Fortune Cookie fast food chinese, Manducatti’s (which has been there forever and used to have Family types (limos out front, private rooms in back if you get my drift)so I tended to stay away (but he food was excellent ’cause grandma was in the kitchen making magic! )), and Manetta’s (which was always a treat and unless it’s changed you should go back again!). I don’t recognize any of the otehrs but it’s nice to hear they are trying. If you haven’t ventured to Astoria, you have to go to Elias Corner under the El on 31st St. I was happy to discover it was still there when I was back in the hood recently. Gardiner, in the last 3 years, the list has grown rapidly. I definitely want to try Manetta’s again and we do go to Astoria fairly often. We tried to get into Elias Corner once but it was packed. Also, Sunnyside has a few good spots now too and Greenpoint is also close with fabulous places too. Any new recipes coming out soon? Sorry it’s been so slow here Marc! There should be a new one up by the end of this week!